Starter Toyoda of TDK (Nikaho). Photo by The Mainichi. Hatakenaka of JR East (Tokyo) hammers a grand slam home run in the bottom of 5th inning. 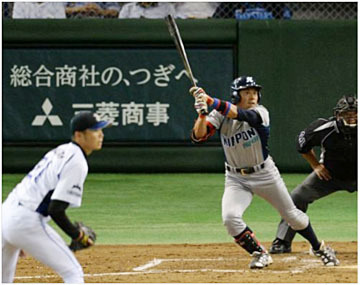 Nippon Paper Industries' baseball team from Ishinomaki, Miyagi Prefecture, defeated JFE Steel Corp. 4-1 at the Intercity Baseball Tournament at Tokyo Dome on July 19 -- earning its first ever berth in the tournament's quarterfinals. The Ishinomaki team is participating in the tournament for the first time in three years, and the second time overall. This is also the team's first tournament since recovering from the devastating tsunami damage that befell Ishinomaki during the March 2011 Great East Japan Earthquake disaster. The team clinched its first victory on July 17. Players were backed by a cheering squad that continued to root for them during their July 19 game against the JFE Steel Corp. team, whose members come from Kurashiki, Okayama Prefecture, and Fukuyama, Hiroshima Prefecture. The stands were practically full with Ishinomaki supporters behind third base, while fans also filled over half of the left field seats. In the quarterfinals, Nippon Paper Industries faces the East Japan Railway Co. team from Tokyo -- a powerhouse that has made it to the finals two years in a row. The tournament is sponsored by The Mainichi Newspapers and the Japan Amateur Baseball Association.